One of the most adored wedding motifs of today is the vintage-inspired theme. And the perfect ambiance to match this theme can be achieved with vineyard weddings! There is something fresh, unique, and romantic about vineyards. The air smells of sentimentality – just the right “feel-good” atmosphere for a lovely vintage-themed celebration. Here are some ways you can re-create that love story of the past into your very own vineyard wedding. 1. Choose subdued, earth tones for your wedding flowers. There is a certain air of vintage in earth tones. Greens, browns, purples and reds highlight the natural beauty of the vineyard environment. 2. Match your wedding decorations with old vintage collectibles. If you have an old book or notebook, a typewriter, vintage-inspired luggage – you can probably display them among your wedding décor in the reception venue. You can always borrow from a friend’s collection to aid you in this. Soon you will find that this turns out to be a budget-friendly motif too! 3. Include grapes, nuts, and other fruits on your reception table. A vineyard wedding is not complete without the display of these colourful and yummy bits. Aside from having them as aesthetics, offer your guests a line of wedding favours featuring these fresh treats. Choosing your wedding wine can be tricky. That is why most couples go for the common favourites of their guests. Since you are holding your event in the Hunter Valley, you are at an advantage. You have immediate access to test and taste the fine wine produce of the valley and determine what to offer your guests. 5. Choose your wedding venue. Not all vineyards are open to crowd celebrations. The best way for you to deal with this is to plan ahead of time. Scout which vineyards are available for wedding ceremonies and choose the vineyard that offers the atmosphere you are looking for. 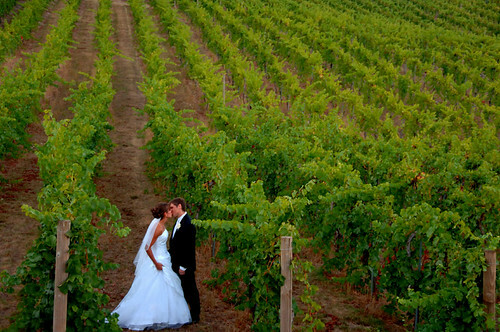 Vineyard weddings make a wonderful twist to the usual garden wedding. In the Hunter Valley region, you can take a nice walk among several vineyards and parks that will guarantee a picturesque celebration. To add more flavour to the event, have your guests come in their vintage-spring outfits. You may let them choose between your selected colours in order for everyone to blend with the theme. Since outdoor weddings are light-spirited in nature, you can expect people to let loose, drink more wine, and just be merry!